3. Landing tab of webi: In case you have several tabs in your WebI. You may want to set one of them to be opened as “default” once user is accessing it. So far I;m not aware that there is possibility ot set so called ”landing tab”. However what is working (at least in my case) is following: Stay in design mode of your WebI on the tab that you want to set as landing one. Then save your WebI. Once you access itthe webi the tab which you stayed in for last time before the saving will be the opening one. This will also apply when you transport the WebI into another system. What will be BEx replacement? If you would go for SAP provenience tool this would be mostly about BusinessObjects portfolio. From these tools most similar to Bex is toll called SAP BusinessObjects Analysis. There is a huge similarity because Analysis same as BEx Analyzer are encapsulated into MS Excel as add-ins. Furthermore almost all features of BEx are supported although SAP claims that Analysis is not BEx replacement. I assume this is mostly they want to leave open doors to other BusinessObjects tool which customer can choose from. There are two separate editions of Analyses available. First is edition for Microsoft Office supporting PowerPoint and Excel. It is called SAP BusinessObjects Analysis, edition for Microsoft Office (abbreviation AO, SMP component: BI-RA-AO-XLA Excel Addin, Secondary Components: BI-RA-AO-PPA Powerpoint Addin). 2nd there is a web version which is called SAP BusinessObjects Analysis, edition for OLAP. Few words about history of the tool: Analysis came with SAP’s acquisition of BusinessObjects. 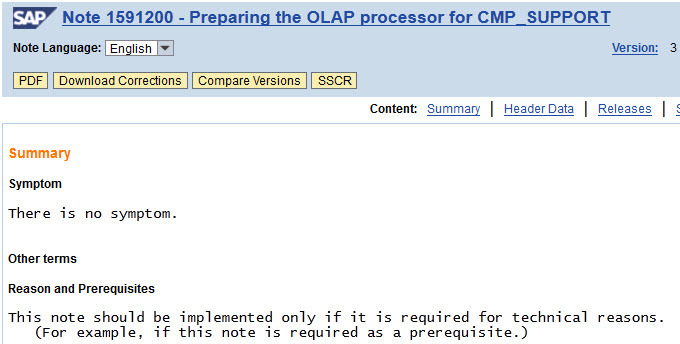 After this acquisition it got the name "Voyager" – its OLAP version. During consolidation of BO tools and their integrating into SAP portfolio the name was changed to "Pioneer". Which was tool combining Voyager’s user interface with OLAP capabilities of BEx. Afterwards new name was chosen "Advanced Analysis" which got finally shortened to simply "Analysis." PS: In case of BEx Web Application Designer (WAD); here replacement’s well: SAP BusinessObjects Design Studio (formerly SAP ZEN). For info on its installation see here. B7 i??? What? What this code is all about? Let’s start with explanation of BS short. BS stands for Business Suite. This is more less clear for everybody who is involved in world of SAP. BS is SAP’s flagship software solution. It basically comprises of different applications covering all the functions of organizations. By those applications are meant following: ERP (ERP as it-self is called ECC (Enterprise Core Component) with all the components like: FI, CO, SD, LO, HR, LO) followed by SCM, CRM, SRM and PLM. Where came number 7 from? Most likely it is a version number. Yes currently we have this most actual version. However speaking about the versions it is usually tricky coming to SAP software. You might be curios what are those innovations within SAP Business Suite? To explore them follow shortcut link /findinnovation on SMP. Generally speaking BS is just umbrella term for applications that are (see above) included in BS. From technical point of view you always have to see what are versions of applications/components and what version of NetWeaver it is powered on. Regarding “innovation” point of view BS includes all the new functionalities which are being delivered via Enhancement Package strategy. For online documentation of Business Suite refer here. Today I’m depicting one BW note which on 1st sight may not any sense at all. 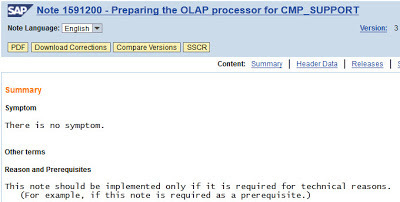 However there must be SAP Notes referring to this one. Nevertheless I would expect at least short notice in this one about its purpose – not just there is no symptom. To start customizing of these functionalities see transaction SOLMAN_SETUP in Solution Manager system. Notice that these functionalities are available as of SAP Solution Manager 7.1 SP 1 and it supports BusinessObjects’s environments based on XI 3.1 and BOE 4.0. I was recently dealing a lot with text variables in BEx’s queries. I found very useful an SDN’s how to paper written by SMP’s support consultant Ricardo de Azeredo Rosa. Ricardo is mentioning how to debug BEx text variables in particular the one based on replacement path. The gist of debugging is to catch ABAP code in FM called: RRSV_CHAVL_TO_VALUE_CONVERT. By this you can easily realize what is happening with your text variable. Why it is getting strange content (e.g. very famous # sign). It is very useful while dealing with variable offsets and other not very known features of BEx. Enjoy reading of this how to paper. As this is my first blog post in New Year 2013 I wish you all of my readers happy and prosperous new year MMXIII.